The following sections describe each of the the main routines used by the software. The 'Import Statement' routine appends new bank statement transactions to the end of the table from a downloaded bank statement file. During the import process, the download file format and bank account is validated against the user configuration settings. Any duplicate records found in the download file are ignored. The bank balance of the first eligible transaction in the download file is also validated against the last bank statement transaction to ensure the transactions are consecutive. Download your latest bank statement in 'Excel/CSV' format then move the file to the 'New Statements' Folder. Note: Co-Op bank statements are downloaded in TXT format. Click on the 'Import Statement' button within the Dashboard. Click on the 'New' Tab (If not already displayed). Select the downloaded file (Click on the file if not already highlighted). Click on the 'Process' button. Note: The total number of transactions added will be displayed. The file will then be moved the 'Processed Statements' folder. To refresh the bank statement transactions, click on the 'Refresh' button from the Dashboard. The Refresh routine inspects all transactions for the selected VT bank account defined in the User Configuration. Reconciled transactions dated before the Accounts Period Start are ignored. Optional 'User Entry' details can be populated for each bank statement transaction to facilitate a more precise match. These details include Analysis Account Name and Account Code (Enter the last analysis account where multiple entries exist). Note: "Deposit List" is included at the top of the Analysis Account Name list. Two attempts are made to match the transactions to the bank statement. The first attempt uses a strict approach by checking the corresponding dates, values and oprional User Entry details where populated. The second attempt uses a similar approach to the first except it attempts to match transactions where the dates are different. The extent of the allowed difference (in days) is controlled by a user configuration setting called the 'Refresh Days Threshold'. The default is 14 days. Transactions that are matched by this criteria are identified by setting the status to 'Assumed match'. The dates for these transactions can be matched later using the 'Synchronise Transaction' button. Duplicated transactions or incorrect transaction value. Transactions entered in VT in advance of the bank statement import. Different transaction dates (above the 'Refresh Days Threshold' setting). Where the user entry details have been populated but differ from the last analysis account within the VT transaction. Normally these can be resolved by amending or removing the user entry details and performing another Refresh. Transactions dated before the accounts period start & not reconciled. Cheque payments or Credit Card receipts etc. Tax point rules may stipulate that the date is different from bank statement date. VT bank transactions can be created, amended or deleted for the currently highlighted bank statement transaction. The button caption in the Bank Statement table will display 'Create' or 'Amend' Transaction, denoted by the status of the transaction. Reconciled transactions cannot be amended or deleted. Note: before attempting to create a VT transaction, it is advisable to review any exceptions. This will remove the risk of creating duplicate transactions. Note: Be careful when amending transactions that are analysed to multiple accounts. Accepting an amendment will overwrite the existing transaction and will be analysed to the account selected by the dropdown list. I.e. the other analysis accounts will be removed from the transaction. Normally, these should be created and amended using VT. This applies where the bank statement transaction's status is "Outstanding". I.e. no matching VT transaction exists. Highlight the desired transaction and click on the 'Create Transaction' button. Populate the data items described below. Click on the 'Accept' button to create the transaction or the 'Cancel' button to abandon. Note: A new bank receipt/payment transaction is created in VT (including any relevant invoice allocations) and the bank statement table is updated. This applies where the bank statement transaction's status is not "Outstanding". Highlight the desired transaction and click on the 'Amend Transaction' button. Amend the data items described below. Click on the 'Accept' button to update the transaction or the 'Cancel' button to abandon. Note: The existing VT bank receipt/payment transaction (including any relevant invoice allocations) and the bank statement table is updated. Click on the 'Transaction Delete' button. Click 'Yes' to delete the transaction or 'No" to abandon. Select the Ledger Name from the dropdown list. The Ledger may be pre-populated by entering the User Entry Details in the Dashboard. Note: When a different Ledger is selected, the Account dropdown list is automatically refreshed. For information, the order that the Ledgers are displayed in the dropdown list can be changed within the VT application. Within VT, click 'Setup', then click 'Ledgers', Highlight the ledger and re-position using the Up and Down buttons. Select the Account Name from the dropdown list. The Account may be pre-populated by entering the User Details in the Dashboard. Note: Where Account Codes are in use, a search option is available to find the Account by Code. VT allows Ledgers to be analised by both built-in and customised 'Analysis lists'. For example 'Currencies' and 'Departments. Where a Ledger is analysed to a list, that list becomes visible and the desired 'List Item' can be selected from the dropdown box. For Currency lists, the 'Currency Amount' also becomes visible when a none 'Base' currency is selected, for example 'Euro'. This normally applies to Profit and Loss Ledgers only. Also applies to Balance Sheet ledgers for VAT Cash Accounting / Proforma Invoices. Select the VAT Rate from the dropdown list (No Scope, Zero, Reduced, Standard) or enter the actual VAT amount. For goods acquisitions from the EU the additional 'EV VAT' box becomes visible allowing entry of the EU VAT amount. For VAT Cash Accounting and Proforma Invoices, the Deferred VAT amount is released to the Normal VAT when the Invoices are matched off. For partial receipts/payments, the pro-rata amount is released. This applies to Customer and Supplier Ledgers only. Under normal circumstances, the sales invoices (SIN) or purchase invoices (PIN) would have been created prior to processing the bank transaction. The VT transaction text is created automatically in one of two formats. This format can be set using the User Configuration Parameter 'Transaction Text Default Source'. The options are 'Statement' or 'Account'. 1. Statement Format: (Default) "TTT - Bank Statement Description" where TTT = Bank Statement Type. 2. Account Format: "TTT - Account Name" where TTT = Bank Statement Type. Text can be entered manually by first changing the 'Allow Text Amend' configuration setting to "Yes". Afterwich the text can be changed for each transaction by clicking on the Check Box. User entry details are populated from the Dashboard for 3 main reasons. 1. To provide a more precise match during the 'Refresh' routine. 2. 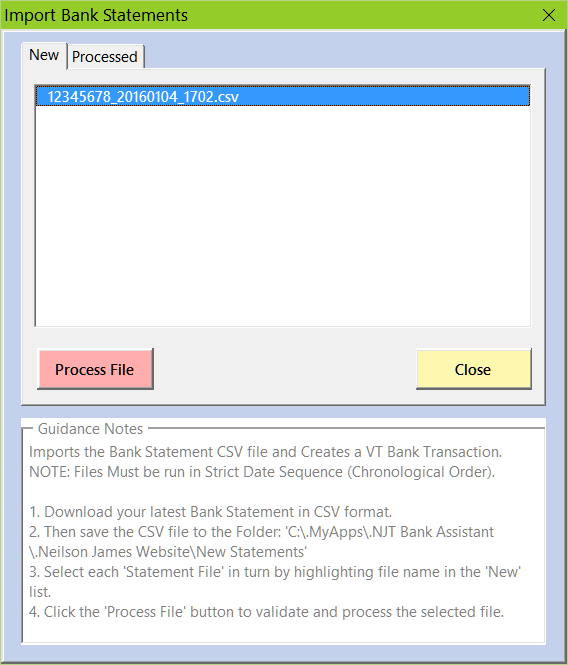 To optionally populate the Analysis Account before creating a VT bank transaction. 3. To designate the transaction as a "Deposit List". Select the Analysis Name from the dropdown list then click the 'Save' button. When Saved, the Bank Statement transaction and Account Code will be updated. Note: The 'Deposit List' item is always listed first. Note: The order that the Names are grouped in the dropdown list can be changed within the VT.
1. Within VT, click 'Setup', then click 'Ledgers', Highlight the ledger and re-position using the Up and Down buttons. Enter the Account Code then click the 'Save' button. When Saved, the Bank Statement transaction and Analysis Account Name will be updated. Deposit Lists are workbooks that contain a batch of customer receipts paid into your bank account. Separate workbook templates are provided for Base (normally GBP) and Currency batches respectively. Note: Each batch should contain only 1 type of currency. For all Deposit List workbooks, you enter each receipt on a separate line. The workbook is pre-designed with entry lines from 1 to 50. For each entry, enter the Gross Receipt Amount, Analysis Account Code , VAT Rate/Amount, up to 3 Sales Invoice numbers and any Entry Notes. Please Note: The VAT Rate/Amount is relevant only to Profit & Loss Account Codes. The Sales Invoice Numbers are relevant only to Customer Account Codes. For the Currency workbooks, you enter the currency amount for each receipt entry and the total amount banked in GBP. Note: During processing of these Deposit Lists, the translation differences amount is calculated automatically using the 'Rate to Base Currency' obtained from the Currency Item in the VT application. During the processing of all Deposit Lists, each receipt entry is validated, including the Account Code, the eligibility of the Account Ledger, the eligibility of the VAT Rate/Amount and the Sales Invoice numbers (up to 3 numbers are allowed). 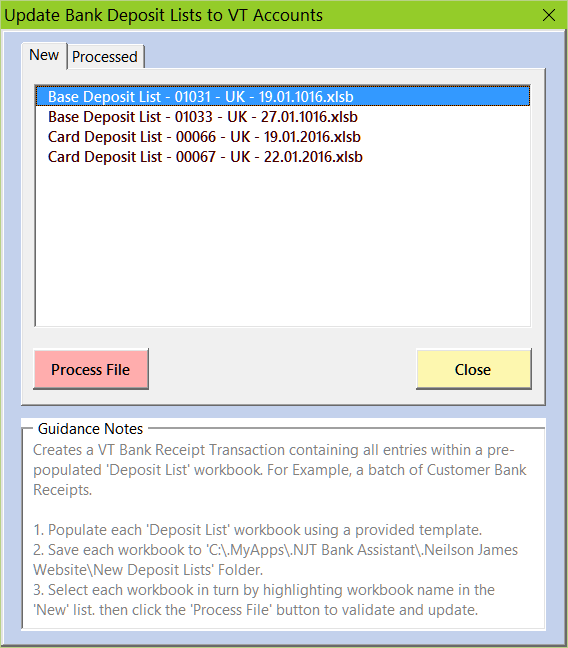 Create a new Deposit List workbook, either using one of the templates provided or using your previously populated workbook. Increment the Batch Number by 1. Populate the Deposit Date. For Currency Lists only, populate the Currency Item (E.G. 'Euro') and the Deposit amount in Base currency (Normally GBP). However, you may not always know the actual GBP amount deposited at this time, in which case, set it to zero. This amount can be populated later when transaction appears on the bank statement. Populate each receipt entry on a separate line. Finally, move the workbook to the 'New Deposit Lists' Folder. Click on the 'Deposit Lists' button from the Dashboard. Select the file (Click on the file if not already highlighted). Note: The batch statistics will be displayed. Click on the 'OK' button to continue or 'Cancel' button to abandon. Note: The workbook will then be moved the 'Processed Deposit Lists' folder. Note: A single VT Bank Receipt transaction (REC) is created in VT containing an analysis entry for each of the deposited items. Translation differences and VAT transactions are calculated and created automatically. A summary of the Entry Notes and VAT amounts are also created automatically in the VT Transaction Notes. Then, refresh the bank statement transactions, click on the 'Refresh' button from the Dashboard. Note: Sometimes the Deposit Date entered in the workbook is different to the date on the bank statement. Where this occurs, follow the 'Synchronise' process. The main purpose of this routine is to provide a quick method to change the VT Bank Account transaction date so that it matches the date on the Bank statement. However, there will be circumstances whereby this is not appropriate. For example, where the Tax Point differs from the Bank Statement date. Although it is not essential to Synchronise, it may help achieve the desired match when the Bank Statement is refreshed in the future, particularly, where many similar valued transactions exist. Tax Point rules may of course prohibit this. For example, a receipt transaction is entered in VT dated '11 April 2017' and the date on the bank statement is '12 April 2017. The bank statement is then refreshed and the bank statement transaction status is set to 'Assumed match'. 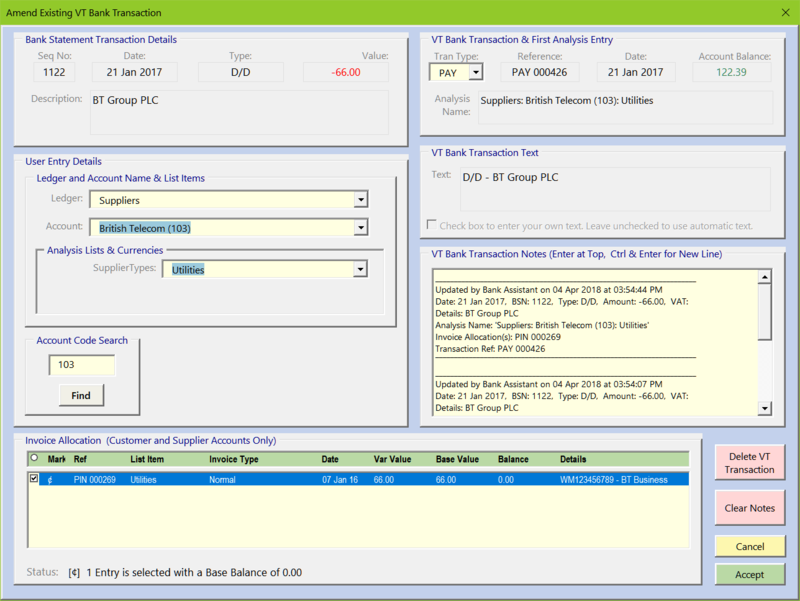 Highlight the desired transaction and click on the 'Synchronise Transaction' button within the 'Bank Statement' tab within the Dashboard. Note: The Transaction details will be displayed. Click on the 'Yes' button to continue or the 'No' button to cancel. Note: The transaction date and the status of the transaction will be changed. Additionally, the User Entry details will be populated where previously blank. This routine reconciles VT bank transactions up to a chosen Closing Date. The Status of all transactions up to this date must be either 'Ready to Reconcile', 'Awaiting Allocation' or 'Assumed Match'. Transactions previously reconciled will be ignored. 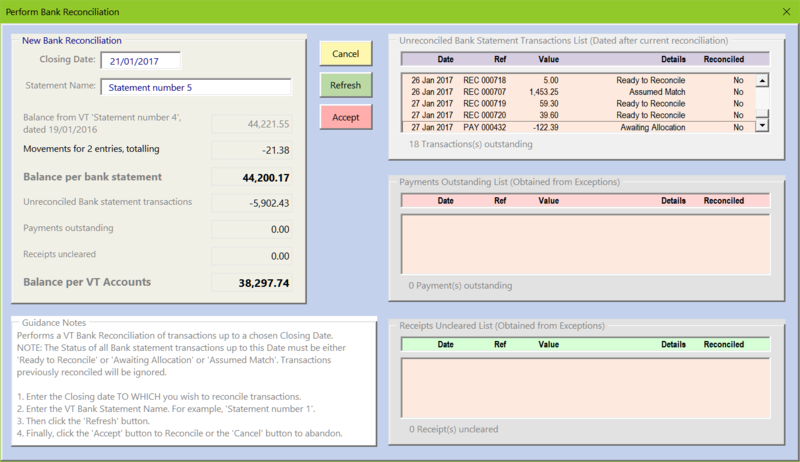 Click on the 'Bank Reconciliation' button from the Dashboard. Note: the bank statement will be refreshed. Enter the Statement Name and select the desired closing date. Then click on the 'Refresh' button within the bank reconciliation form. Click on the 'Accept' button to process the bank reconciliation. Note: the bank statement will be refreshed again.